Stephen Prothero says there are big similarities between Jeremy Lin, above, and Tim Tebow, but big differences, too. 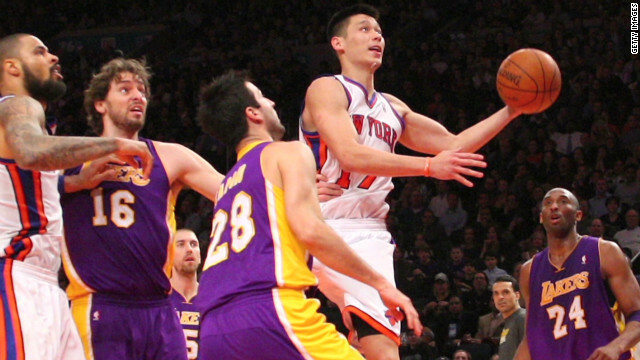 Is the New York Knicks’ point guard Jeremy Lin the NBA’s answer to Tim Tebow? Let me count the ways. First, Lin was underestimated throughout his career. The knock has been that Tebow couldn’t throw. The knock on Lin had been that he wasn’t particularly athletic. Although he led Palo Alto High School to a state championship in basketball, major college programs did not want Lin. And after he blew away the competition at Harvard, the NBA didn’t seem particularly interested either. Undrafted, he warmed the bench at Golden State, then Houston and then New York before getting his big break this year with the Knicks. Second, like Tebow, Lin came out of nowhere to bring a dying team back from the dead. While Tebow turned around the Denver Broncos at quarterback, Lin has led the previously struggling Knicks at point guard to five straight victories, each with 20 points or more. And his field goal percentage during this winning streak tops 50%, not bad for a guy who supposedly can’t shoot. Third, Lin is also a born-again Christian whose fans love him as much for cultural and religious intangibles as for his ability in his sport. But Lin, who told Sports Illustrated in 2010 that he wants to be a pastor post-NBA, also has another intangible going for him—his Chinese-American heritage. Yes, the “Linsanity” is driven by his performance on the court, but it’s also driven by his Taiwanese descent, and the fact that he is one of a handful of Asian Americans to make it to the NBA. Lin also differs from Tebow in his approach to the faith, which is more subtle. On his Facebook page, Lin does quote Colossians 3:23: “Whatever you do, work at it with all your heart, as working for the Lord, not for men." But the "Taiwanese Tebow" doesn’t “Tebow” after a game. His evangelism is decidedly low key. In this way, Lin is a reminder that, like Christians themselves, athletic evangelicals come in all shapes and sizes. Scholars of religion have been observing for years that the Christian tradition is rapidly moving south and east, finding its new home not so much in Europe or in the United States as in Asia and Africa and Latin America. Lin exemplifies this trend, even as he reminds us that American Christianity is changing its face, too. The Asian immigration boom that began with the opening up of immigration in 1965 did wonders for Buddhism and Hinduism, to be sure. But it brought far more Christians to American shores, many of them (like Lin) non-denominational evangelicals. Down the road, Lin will probably get some of the same grief that Tebow has gotten for his outspoken faith. And if he is as human as that faith says he is, his shots are going to clang off the rim some day, and with it some of the sheen on his celebrity. In other words, there is at least as much insanity in Jeremania as there was in the cult of Tim Tebow. To believe in either guy takes a little bit of faith. But for now, "Linsanity" is crazy wisdom, driving Web pilgrims to view the couch where Lin (who makes a paltry $762,000 a year) been supposedly sleeping in recent days and even resurrecting the stock of Madison Square Garden–Linflation?–which owns the surging Knicks. At least for now, Knicks fans seem to be saying that to watch Lin play is to want to watch him more. A lifelong Celtics fan, I've never liked the Knicks. But I want to see Lin more, too. Until he comes to Boston. I do consider all the ideas you have presented on your post. They're very convincing and will definitely work. Still, the posts are very brief for beginners. May just you please extend them a little from subsequent time? Thanks for the post. They are not at all the same. Tebow is good down the stretch, but not a good QB. Lin is the real deal. No one ever, not jordan not kobe, scored as many points in their first few games. Tebow thinks God chooses him to win and prosylatizes (sp? ), Lin is low key. Many people are fans of Tebow only because he is Christian. I am a secular Jew and love Lin because he can flat out play, because he came out of nowhere and because he got a good education. Mr Reality I have personally checked up a lot of the information you put out and unfortunately they were found NOT to be the opinion of the intellectual mainstream. These were Liberal n Deist ideas which have been discounted already but revived to further the cause of atheism. U r being dishonest. Wow. why are you so bitter against Jesus? You must really have some some hurts in your life. However, your "science" is way off.... I'll be praying for you. Blessings! Man you post this B.S. on every blog...come up with something else. He doesn't "Tebow" after games, he prays. Saying you believe in science when scientists don't believe in science is crazy! When scientists say they cannot determine the existence of God but the effects of belief are positive and u say belief is useless u r being ignorant, I'm sorry to say.